Figure 1. Asymptomatic annular lesions on the dorsum of the patient’s hand. Figure 2. Tinea corporis demonstrating the typical scaling edge. Although there is relative central clearing, the skin is still inflamed. A 35-year-old man has two asymptomatic, annular lesions on the dorsum of his left hand, which have slowly expanded over the past three months (Figure 1). What is the differential diagnosis of these lesions? A number of skin conditions may produce strikingly annular lesions. Tinea is a common fungal infection and when it produces the classic ‘ringworm’ appearance it is often acquired from a pet such as a guinea pig or a mouse (Figure 2). Cats and dogs are less common vectors. 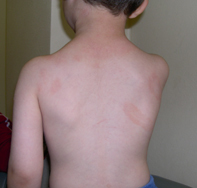 This type of tinea can occur in people of any age. The edge of the lesion is scaly and erythematous and itch is a feature. The diagnosis is easily made by taking a scraping of the scaly edge of the lesion. Results of direct microscopy are available within 24 hours; however, culture often requires three to four weeks. Psoriasis may produce annular lesions with a red, raised scaly edge (Figure 3). It is not always itchy and a scraping will be negative for fungal microorganisms. The diagnosis is usually clinical and other signs of psoriasis are usually present – for example, typical plaques on the elbows and knees, scalp scaling or nail pits. A skin biopsy from the edge of the lesion will show psoriasiform hyperplasia and can confirm the diagnosis if there is doubt. The dorsum of the hands would be an unusual place for annular psoriasis. Sarcoidosis is a rare disease but may produce asymptomatic annular lesions. The edge of the lesion has a translucent red-brown appearance, which is accentuated by flattening the lesions with a glass slide. The centre is often atrophic. A skin biopsy is required for diagnosis, showing the typical sarcoidal granulomas found in this condition. Necrobiosis lipoidica diabeticorum may in its early stages mimic sarcoidosis; however, as it progresses it becomes markedly atrophic with telangiectasias and a shiny pale yellow centre. Most affected patients have diabetes and the lesions are almost always found on the anterior shins. Subacute cutaneous lupus presents with multiple papules and plaques on sun-exposed areas, particularly the face and upper trunk, which evolve into annular lesions with a scaly red edge and atrophic centre. Symptoms are variable. Patients are positive for Ro/SS-A autoantibodies and a skin biopsy shows typical changes. Granuloma annulare is the correct diagnosis. This is a very common idiopathic condition. Lesions are symptomatic and slowly progressive. There is no scale on the expanding edge and the centre of the lesion is not atrophic. In most cases only a few lesions are present at any time, although this is not invariable. Typical affected sites are the dorsum of the hands and feet, elbows and knees. The condition is self-limiting, usually lasting about two years. Granuloma annulare has a characteristic biopsy appearance but is usually a spot diagnosis. Given the self-limiting nature of granuloma annulare, a good option is to let nature take its course. However, if patients are keen for treatment, intralesional triamcinolone 10 mg/mL injected into the edge of the lesion is rapidly effective. Many other treatments have been described with varying success, but in most cases the potential side effects outweigh the benefits.